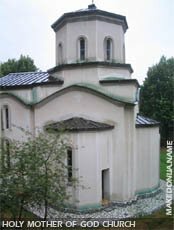 Berovo is a small town, located in the region of the Maleševo mountains in the eastern part of the republic of Macedonia. 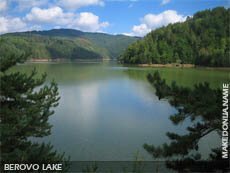 Berovo is situated of the both banks of the Bregalnica river and on altitude of 830-900 meters above the sea level. 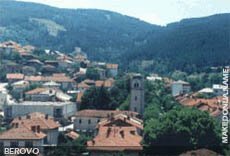 Berovo is a mountainous town with exceptional climate. Berovo can be entered only by a car or bus, because there is only an asphalt road leading to it. It's 161 km far away from Skopje, while from Strumica is 47km and Kočani from 52km away. 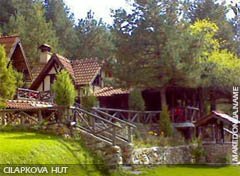 If you are in the mood of seeing how nature succeeded to create unique and unrepeatable beauty, then you should explore its proximate surroundings, in the forests of Maleševo	mountains, where the erect and tall pine trees with their proud looks, are perfectly in accord with the captivating smell and rich green color that makes the architecture of these woods. You can feel the deep shadows and the shamefaced sun peeking besides, following the rhythmic movement of trees loosened by the wind with its beams fighting for space and creating small islands of light in which you can see all possible shades of green color, present in the grass, fern, moss and leaves of all sorts of plants. And, at the end of the forest itself, as a well known scene from the stories, a magnificent horizon opens before your eyes, where the view captures the peacefulness, clarity and countless shades and play of colors of Berovo lake, and in its waters again you will be able to see the reflections of the old tree tops. Trees and forests have perpetually attracted the attention of Berovo population. As a result, Berovo craftsmen are well known for their skills and dexterity of woodworking as their traditional occupation. In addition, there is the production of the famous Berovo cheese, that represents a true specialty with recognizable taste.